This week’s Website of the Week goes to Inspired Experiences Limited for their uniquely colour-schemed site and their creative use of stock images. The client was very involved with the build of their website and offered their own creative input on the project from day one which made the process fantastic for both parties. 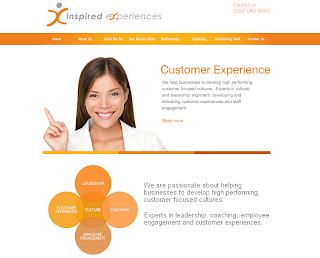 Inspired Experiences itself, is a team of expert consultants and coaches who design and deliver programs to develop high performing, customer focused culture in organizations. Julie Robinson, the founder and our liaison on the build of the website, has extensive corporate experience and has held a number of senior roles in customer services, operations and transformation and planning. At Virgin Atlantic she worked with Richard Branson to develop and deliver the branded customer experience that has been a key element of Virgin’s style and success. The client specifically requested a grey and orange colour scheme which, as you can see, really stands out from the crowd and is a very rare choice when it comes to company colours. This palette was then used consistently across the logo, text and even the images on the site. The client even provided visual content themselves in the form of resourcefully modified stock images that were created in simple image editing software available to anyone. With Toolkit Websites it’s completely up to each client how much control they want over the design and layout of their website. We make the site bespoke to you and can offer as much or as little input as you want. With regards to design, there are a wealth of different resources at your disposal: everything from the experienced opinions and insights of your very own Project Manager to helpful Stock Image websites which can provide material or offer inspiration depending on what you require. Toolkit Websites are expert website designers in Southampton, Hampshire, UK. Get in touch to see how we can help your business grow.